Have you ever tried to open the liftgate on your SUV when your hands are full? It's a hassle. But with the popular SUV, the Ford Explorer, there are several innovative design features that will cut down on the hassles you experience doing everyday tasks. Design features such as the Hands-Free Foot-Activated Liftgate will really make your life easier. The vehicle senses the fob on you, and all you have to do is kick your foot out to get the liftgate to swing open, leaving your hands free to do other things. 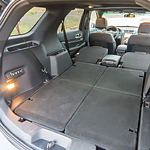 And with the amount of available cargo space, you'll be free to load up the back of the vehicle. The second and third row seats fold down to accommodate even more gear. If you're interested in making your life easier, and you want to know how the Ford Explorer can make that happen, stop into Bell Ford in Arlington, WI for a test drive. See Our Ford Explorer Inventory!